To be honest, Ramen Alley wasn’t our first choice of venue to have Sapporo’s signature miso ramen. 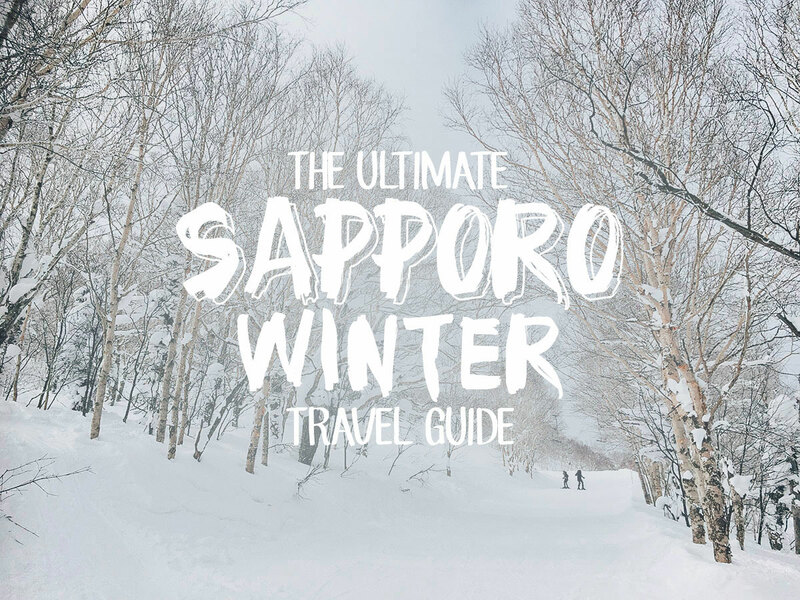 When doing research for this trip, I saw many locals refer to it as a tourist trap, a place to steer clear from if you were serious about miso ramen. They warned of the ramen restaurants in downtown Sapporo that served them with sweet corn (gasp!). Sweet corn in ramen is for tourists they said, and something to avoid at all costs. 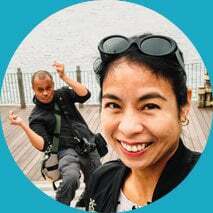 I took their warnings to heart and decided to add Ramen Alley as a mere backup, relegated to the last page of our itinerary with an asterisk beside its listing. We would pass by to take pictures, mention it briefly in our blog, and that was it. We would DEFINITELY not be eating there. But as fate would have it, we did eat there, and it turned out to be pretty good. Scroll down for the story. 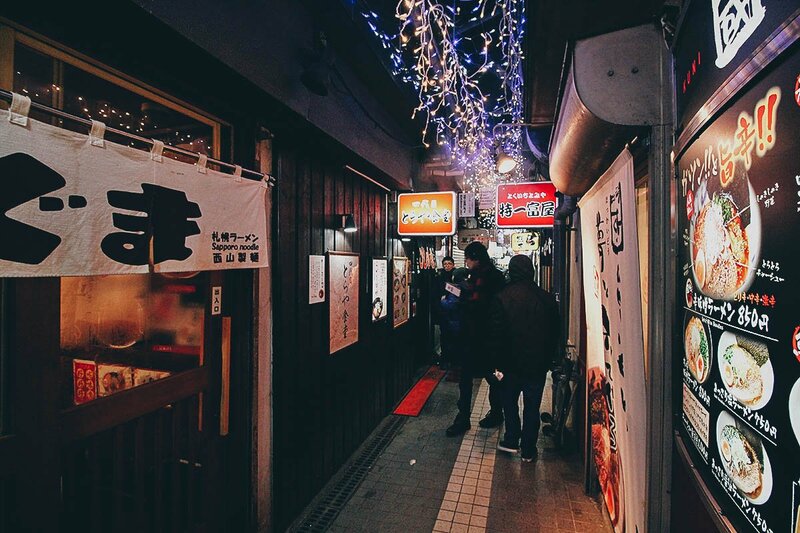 One of the entrances to Ramen Alley. We ate at that restaurant on the right, the one with the yellow curtains. 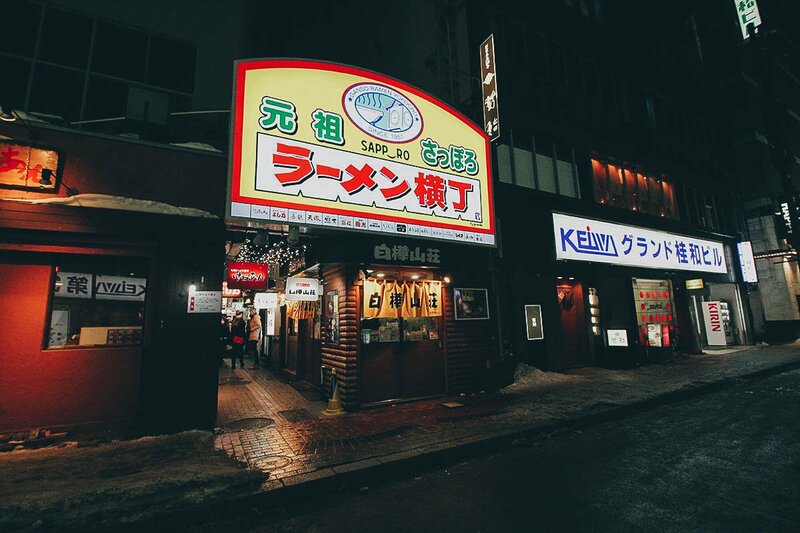 Ramen Alley is literally an alley of restaurants the length of a city block. There are entrances on both sides and every restaurant here is a ramen specialty restaurant. Walking through Ramen Alley. We were supposed to eat at the popular crab restaurant Kani Honke this evening but they were fully booked. We tried going to another crab restaurant nearby but they were closed. Aaaaargh! Frustrated and famished at this point, Ramen Alley was close so we decided to just eat here. Ren had this bowl of miso ramen for JPY 780. 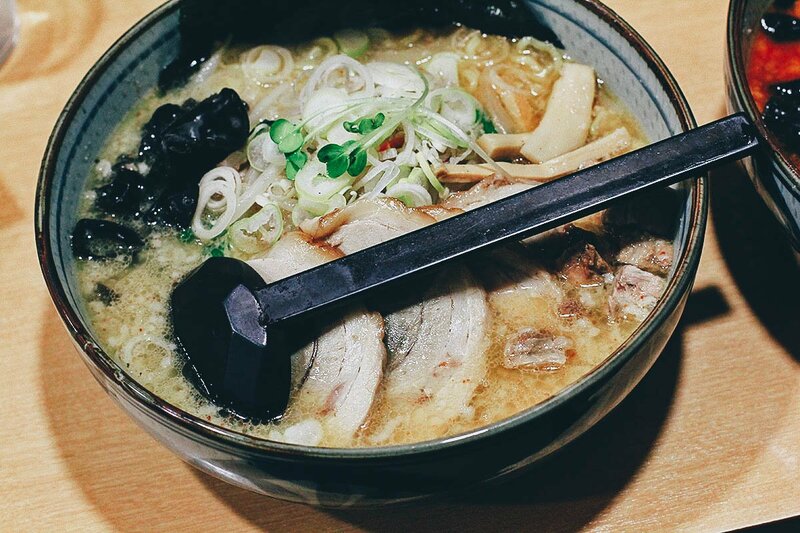 As its name suggests, miso ramen is flavored with miso (soybean paste) and oily chicken or fish broth to create a rich, fatty, and hearty soup topped with a variety of ingredients like chashu (braised pork belly), nori (seaweed), ground pork, leeks, scallions, onions, bean sprouts, hard-boiled egg, sesame seeds, and chopped garlic. 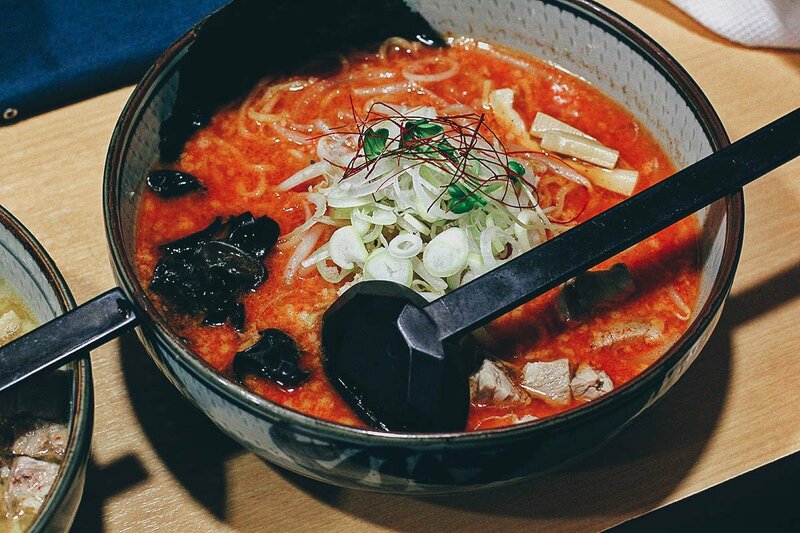 Our bowls of ramen didn’t have all that, but do you notice what else is missing? Corn! 😆 From the looks of it, Shirakaba Sansou is legit despite being in “touristy” Ramen Alley. Delicious! I ordered this fiery-looking bowl of spicy miso ramen for JPY 860. It was pretty much the same as Ren’s but spicier. Shirakaba Sansou has a basket of hard-boiled eggs on the counter and you can help yourself to as many of them as you like. 🙂 Before flying to Sapporo, we spent a night in Fukuoka and had their signature Hakata ramen. I actually preferred that but Ren liked this miso ramen better. So in spite of all the bad mouthing Ramen Alley got online, Shirakaba Sansou turned out to be pretty good. I haven’t eaten enough ramen to really know good from bad, but what we had here was delicious. It was the only time we ate ramen in Sapporo so I have nothing else to compare it to. But if it’s any indication, Shirakaba Sansou has a solid rating of 3.45 on Japanese review website Tabelog. To put that in perspective, the ramen place I wanted to go to – Ramen Shingen Minami-6joten – is only slightly better at 3.58. 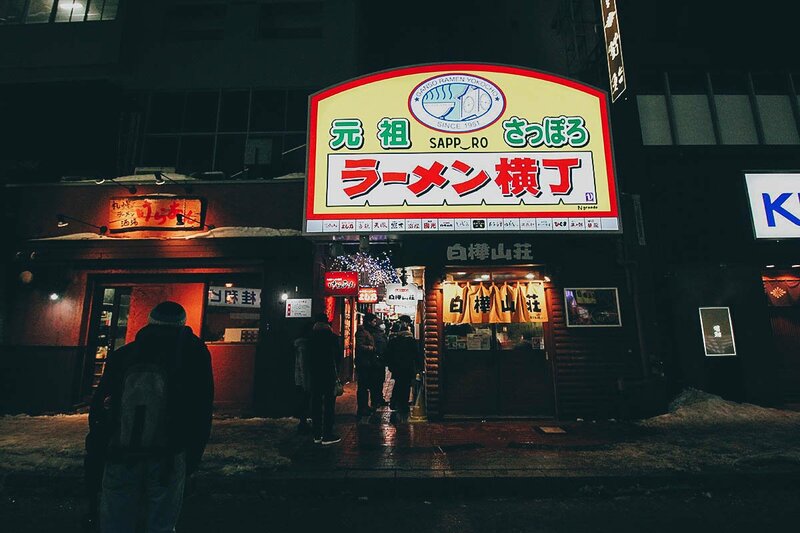 That place is practically on every “best ramen” list in Sapporo so those ratings are telling. If it’s true that the ramen restaurants in Ramen Alley are generally touristy, then Shirakaba Sansou is a real find. 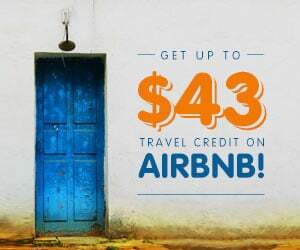 Go there. Take the subway to Susukino station. 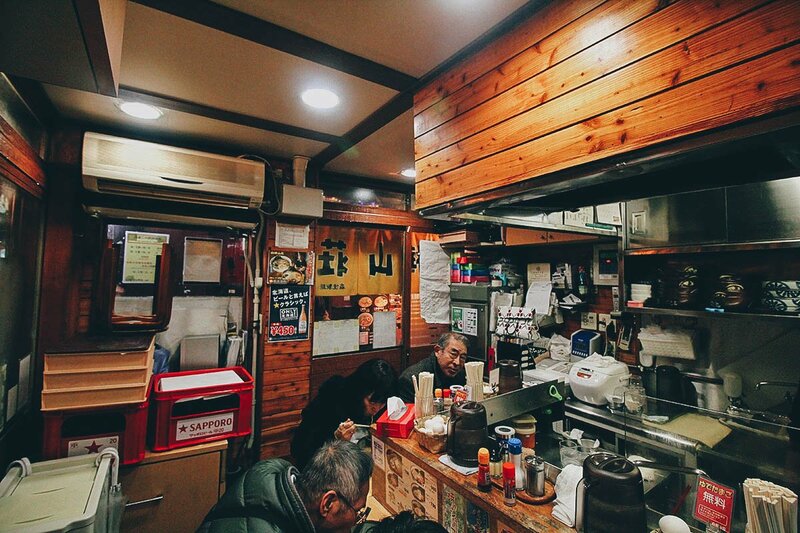 From there, it’s about a 3-minute walk to the entrance of Ramen Alley. CLICK HERE for a map and walking directions. Ramen is life. I need to make it out there!